In this note, we improve upon some recent results concerning the existence of large monochromatic, highly connected subgraphs in a 2-coloring of a complete graph. In particular, we show that if n≥6.5(k−1), then in any 2-coloring of the edges of Kn, there exists a monochromatic k-connected subgraph of order at least n−2(k−1). Our result improves upon several recent results by a variety of authors. Colton Magnant. 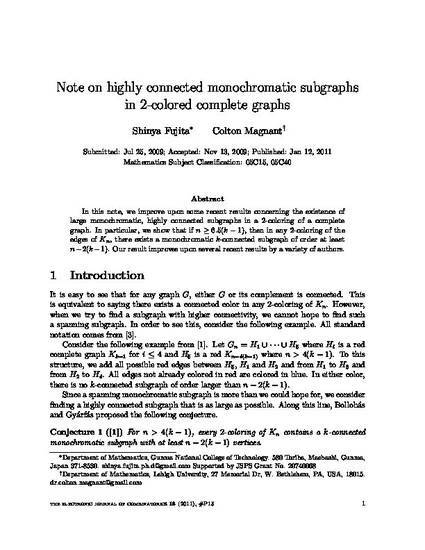 "Note on Highly Connected Monochromatic Subgraphs in 2-Colored Complete Graphs" The Electronic Journal of Combinatorics 18.1 (2011).